Does anyone else love the Nintento Wii like I do? Yes, it drives me crazy when the kids whine about wanting more video game time, and the fact that the Wii controllers keep going bad makes me want to scream. (Does everyone have that $50 problem?) You’ve heard this before, that it can really be a FUN way to have family time and get your body moving, but what I love is that ALL ages get into it. Toddlers and teens (of course), their parents, and read below for a story about why you might want to give one to your retired parents, too! The only bummer is that I don’t get enough time to play around with it, so I know there are a zillion other cool games I’ve never explored. I hope you’ll tell us what are your favorite Wii games? Rayman Raving Rabbids – Our ten year old got me onto this game where you have to get your timing down right and bounce the rabbits off the stage. Sounds dumb but it’s challenging and a riot and your arms get tired. You actually can play a lot of different games on here but the others all seem to involve toilet plungers (?) and I love how you feel like you’re dancing with this one if you get your beat down. 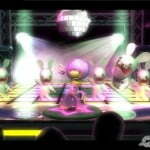 Just Dance – This is my latest favorite that Megan got me hooked onto. It brings back my Pom pon days – pathetic, I know, but I loved those days! For this one you get points for moving your body just right and matching the movements of the fake person on the screen. You get to pick your music and this one is the best for working up a sweat! Wii Sports – The day after I do some of these games my muscles are sore. I could hardly move my arms after boxing the night before. Home Run Derby is a blast! Even when our youngest was three he was hitting more balls out of the park than I did. (The little snot.) By the way, for some reason I couldn’t find a link for Wii sports, so I thought I’d show you this one instead: Wii Sports Resort. Our son is getting this for his birthday soon, so I’ll know more about it then. 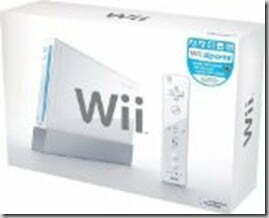 They have the regular Wii Sports that comes with the Wii, along with Wii fit with the balance board. (Wii Ultra Fitness Bundle) Mom's balance was the biggest issue she had after her strokes and this has really helped her. She had completed almost 9 months of physical therapy on and off with some improvement but after working on the balance session on the Wii Fit she has greatly improved. Around Thanksgiving time she could hardly walk up the bleachers alone at our son's game, but six weeks after working out with the Wii Fit, she was able to get up and down the bleachers by herself. Mom and Dad have a Wii fit workout that they do almost everyday. I think it has been great for them to keep moving in the winter months since they do not feel comfortable walking too much around the neighborhood in the cold and on the icy sidewalks. They have also been playing the bowling and golf games together instead of just sitting and watching TV at night. We weren’t sure how much they would use it but thought it was worth a try. We thought Dad might play the golf game but to our surprise he doesn’t like to miss his daily workout. The Wii keeps track of his progress and I think that helps keep him motivated. lol, this is such a funny post! My hubby and finally just bought a new TV after being without one since last summer due to a bunch of house remodeling projects. Anyway, we’ve been talking quite a bit about getting a Wii (now that we have a great new TV, we need all the fun stuff too, right??!) and probably will get one pretty soon. I’ve been wondering about the Wii fit and active, so it’s great to hear that so many people love them! I love the yoga on the Wii Fitness! It’s nice because it allows me to see how well I am balancing myself. Which is nice since I’m far too shy to go join a yoga class! To answer your question, Jenn, I do think the Wii is worth it and while still a video game (and something you’ll need to LIMIT for sure), at least they’re moving more than with your typical video game. This may sound dumb, but I also like having something you can take away as a consequence for whatever they may have done! And in the winter (or too hot summer days) it does give them something to do when they’ve already played outside for a while. As I said, though, I do limit the time. I want them to love board games and books, too! I love, love, love my Wii! We have Wii Fit and Plus, which are nice but kind of silly (they keep calling me a Yoga Master! Please!) 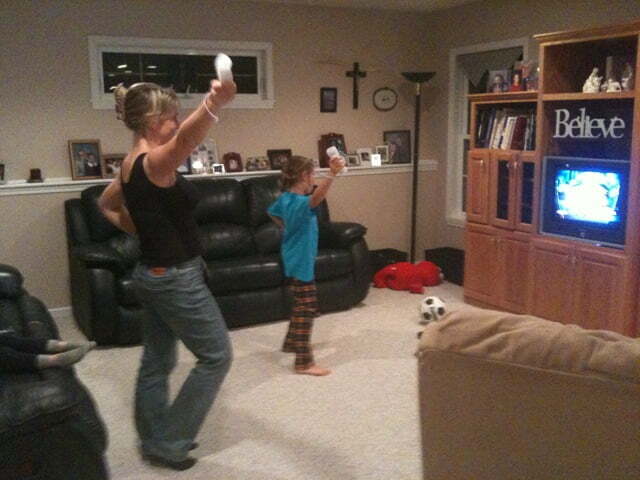 We also have Wii Active and I find that a really awesome workout. But I’m finding workouts in the strangest places: Wii Music has a game called Wii Maestro where you conduct an orchestra. Some of the pieces can be very aerobic! Hubby loves golf games and our cheerleader girl has a cheerleader game! We haven’t had a controller go bad, but we bought them with the unit at the same time (when the game was first introduced to the public) so it could be a new glitch. We invested in some rechargeable batteries for them, because the motion plus saps batteries really fast. Yeah, EA Sports Active is the best and I see they have a new one if you want exercise specific workouts. I find that most games have an easy way to play them lazily (although I’ve never played any dance or rock band type games), which I unfortunately found out soon after we got it, lol! I have problems with wii-motes too. I ended up buying some from https://www.dealextreme.com/ . https://www.dealextreme.com/details.dx/sku.23258 is a really good one; we have two and they work better than what came with the system or the ones we payed a small fortune for (I wanted enough for 4 players but didn’t have an arm and a leg to spare, lol!. I maintain that Wii Active is even more amazing than the Fit. While it doesn’t rely much on the balance board, it beats Fit on all other aspect. Otherwise I don’t play much with the system, no time with school! One game I DO love, and is good for all ages (though a one player) is Rune Factory Frontier. There’s both the sim side (live in village, get along with people, woo girls, farm) and rpg side (go through dungeons to advance stats and also story). Maybe come May I will get Sports Resort. I do enjoy the general Sports stuff but rarely play it now. With only a few options, it gets a little tiresome for me. It’s the only video game that I can beat my nephews at! We get up north only a couple of times a year to see the family since we relocated in 1994. It gives me some time to trashtalk to them and get to know how they’re really doing too. I love the Wii! !